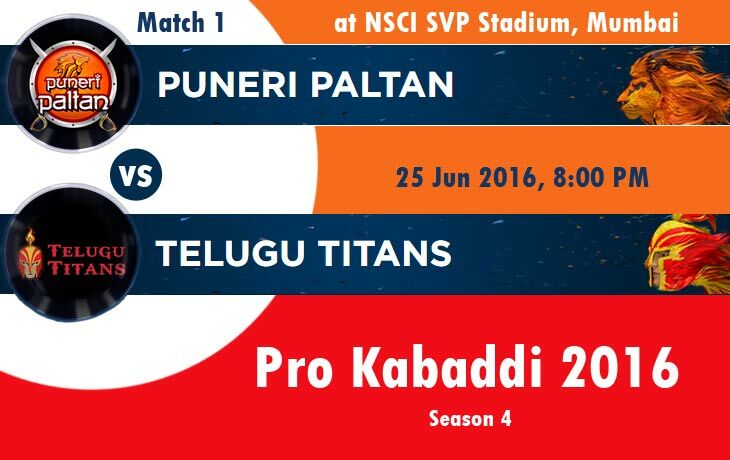 Puneri Paltan vs Telugu Titans Pro Kabaddi 2016 Live Streaming: The Pro Kabaddi 2016 and the Season 4 will begin with the battle of Puneri Paltan vs Telugu Titans on June 25 at NSCI SVP Stadium, Mumbai. Scroll down and get the Match Updates and Pro Kabaddi Live Streaming Info. Puneri Paltan Playing 7: Deepak Hooda, Somvir Shekhar, Manjeet Chhillar (Captain), Nitin Tomar, Ajay Thakur, Ravinder Pahal, Joginder Narwal. Telugu Titans Playing 7: Shashank Wankhede, Jasmer Gulia, Vinod Kumar, Rahul Chaudhari (Captain), Nilesh Salunke, Sandeep Narwal, S Mahalingam. SUBSTITUTES: Vinoth Kumar, Md Maghsoudlou, Sandeep Dhull, Rupesh Tomar, K Prapanjan. Pro Kabaddi Season 4 Points table & Standings last update is June 25, 2016 (21:08 IST). This Points Table and Standings will not be updated after this Match 1. Please Visit the Pro Kabaddi 2016 Schedules and More Update Page to know the current points table.